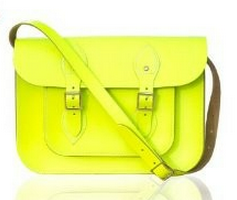 #3 (my obsession) Neon accessories. I have seen many teenagers sporting this AMAZING leather messenger bag. Worn slung across the body with the buckles opened, it is absolutely perfect, and if I hadn’t seen it on many a ‘tween, I would be sporting it too.